Titanium U tubes Gr.2 manufacturer from China application in heat exchangers. Based on service concept of ‘Professional, Efficiency, Integrity, Mutual Benefit’, and aim for “quality survival, Integrity in market”. Looking forward to providing more excellent products and sustainable technical solutions. Baoji leabon special metals Co., Ltd. is a comprehensive enterprise integratin R&D production and sales.It shares high-quality industry resources and information via strong comprehensive strength of "Titanium City of China" industrial cluster, we're providing competitve products and good service to satisfying customers on domestic and international markets. 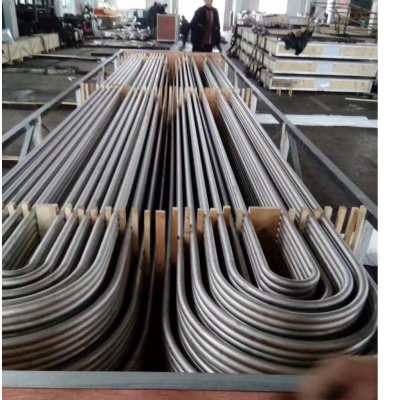 The company specialized in maufacturing seamless tubes, welded pipers,containers, casting, forgings, standards as well as plates, bars, wire with rare metal materials of titanium、nickle、zirconium etc. The company has all kinds of products with high accuracy, raliable quality and excellent properties, are windly used in aerospace, chemical plants, sewage treatment, medical industry, surgical implement etc. The company has strong technical force, with highly professional R&D team and excellent marketing service team as well as advanced, perfect pre-sale, sale, after-sales service concept. It focused on user needs, pay close attention to quality management, and constanatly improving professional and service level. Our products are export to Europe, North American, A frican and other places, and won highly praise. Titanium tubes; Titanium U tubes; Gr.2; Heat exchangers.